1956 Buick Special 4 Door Hardtop Photo Picture Classic Cars for sale & Classifieds - Buy Sell Classic Car & Classic Truck Classifieds. 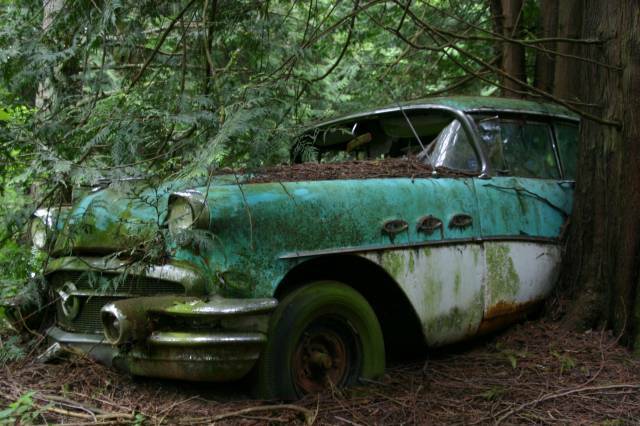 This old Buick has been parked next to this tree for so long the tree trunk has started to crease the door! Tabs show the car as last being licensed in 1966; too bad somebody didn?t rescue the car then! Reminds me of a lucid dream I had of finding several Caddies in a backwoods lot. Seemed so real. Looks like mother nature slimmed her. It's a '56 Special and, figuring by the lenght of the front door, a four-door hardtop. I owned a '55 Century Riviera two-door hardtop same color scheme! Great Rides! Its too bad I didnt see this one sooner! A guy had one just like it (except it was gray primer and a driver) for sale for 1,200 bucks It lasted for a month or 2 and now its gone. It was at a auto recovery business so it either sold or scrapped. Second of the 2 would make me sick since it was pretty much rust free. That is a 55 or 56...identical to the one my mother drove when I was little...right down to the color! Looks like a 56 hardtop. We had a 56 4door hardtop Special when I was a kid. Coolest car we ever had. Two tone, Yellow over creme. They were tanks. Some drunk guy bounced off the rear bumper once with a pick up and it didn't even dent it. that is a real shame!